© 8th Street Production Co.
Just when you think we’ve reached maximum bacon, a new pork-related invention hits the scene. Or rather, one has driven onto the scene. The Black Label Bacon Bike is a Track T800 CDI diesel motorcycle that has been outfitted to run on a biofuel converted from bacon grease. The bike gets between 75 and 100 miles per gallon, and at $3.50 a gallon the fuel is notably cheaper than the gas we buy. Even better than that? According to the bike’s designers, its exhaust actually smells like bacon. Don’t start frying up your own fuel yet though. The bike is currently one of a kind—the subject of a film called Driven By Bacon, which is set to premiere at the International Bacon Film Festival, August 29 in San Diego. Hormel is funding the film, we assume to encourage more people to buy bacon (as if anyone needed convincing). 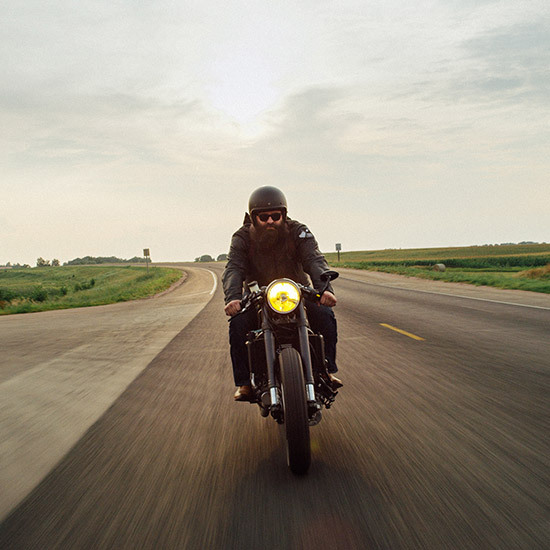 The bike has been touring the country with stops at the Sturgis Motorcycle Rally in South Dakota, rodeos in Utah and, obviously, Bacon Lands at last weekend’s Outside Lands Festival. It’s currently resting in San Diego until Driven By Bacon’s premiere. Those who aren’t planning to attend the International Bacon Film Festival can still catch a glimpse, and more importantly, a whiff, of the bike at its permanent home in the Spam Museum. Yep, there’s a Spam Museum.